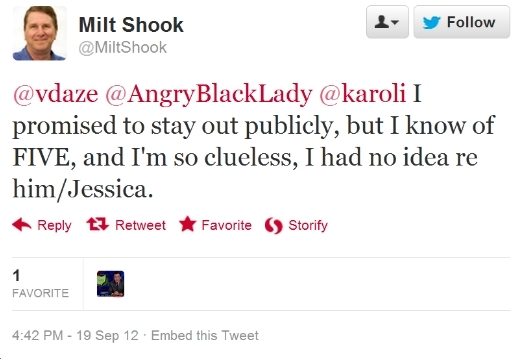 Examples Of How Milt Shook "Mostly Stayed Out of This Whole Shoq Business"
Note: Below are a small sampling of his hundreds of tweets in just the past few weeks. He's deleted many since. Watch him pivot from being an "observer" with no agenda, to a staunch advocate for the women on just one side of this intense Twitter melodrama. These are just a few blatant examples of his involvement, hypocrisy, and agenda. See Also: A Log of all of his tweets (even many he thought that he'd deleted). In many of his tweets shown on the tweets exhibits page, you can see how hard our Superman, Milt Shook tries to assert that he's just an outsider to the entire drama that has encircled my life for months. This, almost 4 months since he got involved with StopRush, 11 days before his "Burn notice, burn notice" screed, 15 days after my apology for raising my voice last January, and 33 days since @vdaze and @angryblacklady and their group began their attacks on me (on a daily basis). He alleges here that he knew nothing of my cyber-romance with @vdaze (though it had been famous fodder for almost 6 weeks before he wrote his hit piece). Here, our outsider volunteers that he knew of "5 women" I had bullied (but he doesn't name any). That number grew to 7 in other tweets. Once again, none of these assertions have been supported with a single example or other form of even hearsay evidence. Nothing. Nada. Like Mitt Romney, he just says it, and assumes a certain audience will assume it's true. Posted in miltshook, Shoq Value.